Hello creative friends! Hooray for Monday! I know, you don't often hear people celebrate Mondays, but I happen to love them. It means my kids are off to school and my husband is off to work, so I get the house back to myself (and back in order, which takes half the day!). I'm SO excited that Mother's Day is next weekend. I personally believe that Mother's Day should be the most celebrated holiday of all! Yes, even over Christmas. ;) Moms are the best and should be celebrated wholeheartedly! I'm looking forward to celebrating all weekend with my mom and sister. If you haven't already done so, you'd better get those cards in the mail! 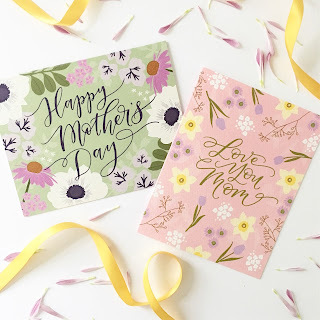 I was working last week on the envelopes for my mom and aunt, two of my favorite moms. I'm sending them cards that I designed for Peony Hill Press, and I like to coordinate my envelope artwork with the cards. First of all, I do a little sketching out and "planning out" of my design. I know, it may seem like a lot of effort, but it helps me get an idea of the space required for the name, address and artwork I have in mind. Oh yes, I certainly do freehand on occasion, but I find that I have more success with a little planning. I think this may be true with most things in life - LOL! My favorite pens for brush lettering and illustration are the Tombow Dual Brush Pens and Tombow MONO Drawing Pens. But Copic and Koi brush pens would work great as well! And a smooth, high quality envelope is a must. One of my favorites is the Classic Crest A2 or A7 envelope in Solar White. I'll write out the name and address info first, then fill in the space with the artwork. Also, if you keep your pencil marks light, you can often erase much of them after the brush pens are dry!